Madaba Map Challah Cover CAT# CHE-22. Chain - stitched hand - embroidery on raw cotton using various colors of silk, gold and silver threads. Size: 20" x 16". 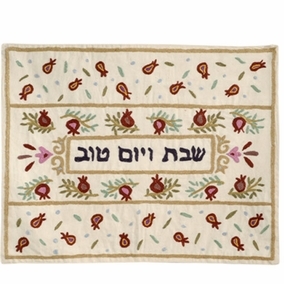 .Challah covers are typically decorative in fabric and design. They may be made from velvet, silk, leather, paper, etc., and can be hand- or machine-embroidered, painted, appliqued, tie-dyed, and the like. They are sometimes adorned with fringes that may be interwoven with silver or gold thread. The challah cover must be large enough to cover two braided loaves without allowing the bread to be seen through the sides, and opaque enough so that the loaves cannot be seen through the fabric. Extra-large challah covers are often chosen as a prominent centerpiece for large Shabbat tables. Challah covers hanging outside a store in Jerusalem bear the logos ("To honor Shabbat and Yom Tov"), top and center, and ("To honor the holy Shabbat"), bottom. Store-bought challah covers often bear the logo, ("To honor the holy Shabbat") or ("To honor Shabbat and Yom Tov"). Some are made especially for use on Rosh Hashana and Sukkot, decorated with appropriate holiday motifs. 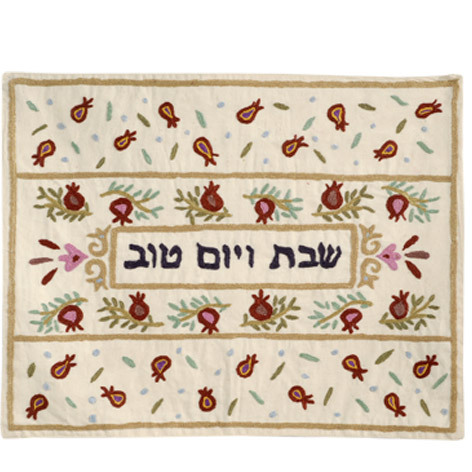 When purchased as a gift, such as for a newlywed Jewish couple, challah covers are often embroidered with the family name of the recipient.